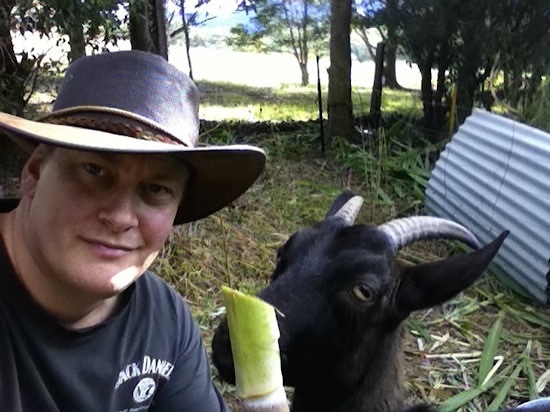 Some unfortunate news this week, I’m afraid – Tom, our lovely Australian Melaan goat, passed away suddenly on Wednesday. Tom in happier times, hanging out in his goat-house. I’m not sure what happened to Tom. He deteriorated very rapidly, and died during the day while I was away at work. I wonder if he may have been bitten by a snake the day before, as I had him clearing some rocky, shrubby ground. 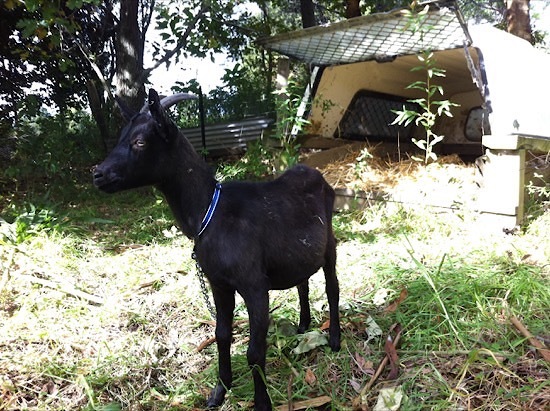 In hindsight he was a little off-colour when I put him back in his pen that night. Or he may have eaten something he shouldn’t have. But there are several problems that can kill goats quickly, so we’ll never really know. One thing Tom loved was a sugar-cane treat! First job when I got home from work that afternoon was to dig a bloody big hole. Perhaps fittingly, it started to rain while I was burying him. I’m going to plant a tree on top of his grave – maybe a chestnut or walnut? I made a happy discovery while burying Tom – I uncovered some eggs while digging the soil. They were about the size of quail eggs, and at first I thought they may have been snake eggs. Unfortunately I had put the spade through one of them, but looking inside I found a tiny turtle! It’s not often you find turtle eggs buried in your backyard! I felt terrible for having killed one, though. The little guy inside was fully-formed but with the yolk still attached, so I’m guessing they’re going to hatch in the next week or so (maybe around the full moon on Feb 4?). I think it was an eastern long-necked turtle, which we have plenty of in our dam. I carefully covered the rest of the eggs back over with dirt, and will be checking every day to see when they emerge. Sorry, no photos; I left the camera inside because of the afore-mentioned rain. So there you have it, a very sad day somewhat balanced by the promise of new life. Sorry to hear about the goat, but a very ‘circle of life’ kind of day. I look forward to seeing photos of the tiny turtles emerging, if you get the chance. Thanks Phil. I’ve been checking the turtle eggs morning and night, and no signs of anything yet. Feeling very David Attenborough :-).